AIML Language on Python. Making Chatbots. 2. Decompress the zip file and leave on a directory where it won't be moved as shown on figure 1. After having installed the library its time to create our first chatbot application. 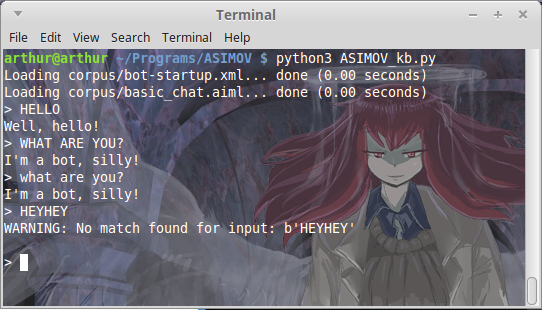 This chatbot will load a .XML file that contains all our .AIML file directories and will initialize an infinite loop where it'll receive user input. For every input received it will try to match the string with one of the responses available in the database (the .AIML file) and output an answer. To stop the bot we must press CTRL + C.
This file contains the responses to the user based on a series of templates. In this case we only have responses to HELLO and WHAT ARE YOU. This file is the Python3 application that loads the knowledge base and parses the user response. The .aiml and .xml files were stored in a folder called corpus in the application directory and are required to operate. #Manages the knowledge base used to think. Despite how powerful the AIML language is, its slow to load when you have a huge number of files operating. In order to overcome that limitation its possible to create a brain file (.brn) that preloads the used responses and ensures they are available on the next execution without having to load the files. Here's the code necessary to create the brain module. #Load brain file if available to speed load times.